Product prices and availability are accurate as of 2019-04-18 11:10:04 CDT and are subject to change. Any price and availability information displayed on http://www.amazon.com/ at the time of purchase will apply to the purchase of this product. In this attractive volume, Simonetta Carr introduces young readers to the life, thought, and work of one of the most famous Reformers of the Christian church. She tells about the life of John Calvin from his birth to his death, placing him within the troubled context of the sixteenth century. 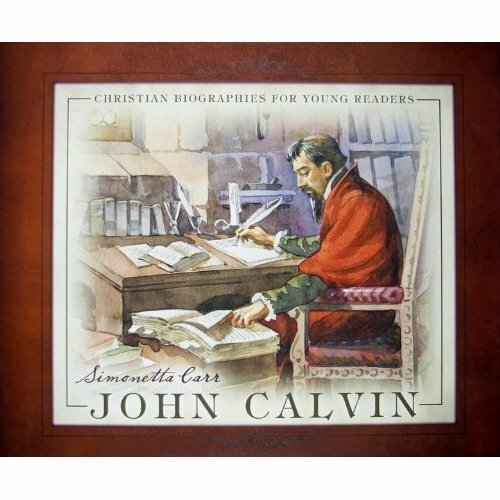 She also introduces Calvin's writings in a way that children will desire to know more about his ministry and influence. Readers will come to know Calvin's personality, his devotion to God and the church, and the personal challenges he faced. They will understand the struggles the early Reformed church faced at that time, not only surviving attacks of the Roman Catholic Church, but also achieving a clear identity and a unified doctrine. They will also have a glimpse of life in sixteenth-century Europe, stricken by pestilence, poverty, and wars. Simply written, and full of interesting facts, this book makes a great gift for children of this rich Reformed heritage. Series Description The Christian Biographies for Young Readers series introduces children to important people in the Christian tradition. Parents and school teachers alike will welcome the excellent educational value it provides for students, while the quality of the publication and the artwork make each volume a keepsake for generations to come. Furthermore, the books in the series go beyond the simple story of someone's life by teaching young readers the historical and theological relevance of each character.